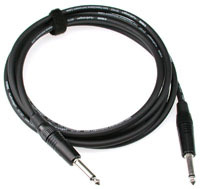 Klotz LaGrange Guitar Cable 10ft. Outstanding quality for guitarists that demand the best. Its ultra-durable jacket and double screen protect against subsonic noise and withstand the toughest tensile and impact stress. The capacitance spec is among the world's best, reproducing guitar sound perfectly no matter how long the cable route. Every studio should have them! Available in straight to straight end connectors and for a $6 upcharge, straight to right-angle end connectors.